CABridges.com » I’m a cover boy! 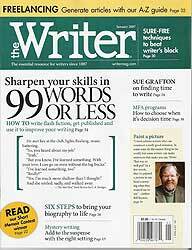 The January edition of The Writer magazine (on sale now) has a feature on writing flasher stories and there’s an entire story on the cover with a familiar byline. Turns out I can write short stories and three years of newspaper columns with little recognition, and a quickie story I wrote for the heck of it for BirdandMoon.com’s 55-word challenge gets me the cover. Gotta love it. Here’s the whole thing (but you should buy a copy anyway, for more comments from me and a nice long article on short, short stories). 55 words, not counting the title. He met her at the club, lights flashing, music battering. And she smiled, sadly, and walked away.